Sike Design and Construction LLC. was recently awarded a large custom rock job on the north shore of Kauai by Pacific Paradise Homes. Our scope of work included adding 4,700 sqft. of custom rock work covering various columns, entryways, and doorways of this multi-million dollar home. Using an exotic mix of hand-picked blue rock, moss rock, and lava rock we’re currently moving nicely through the job, and are hopeful in finishing the project by mid to late November. The majority of our custom rock work is highlighted within home’s pond that encompasses the front of the dwelling, and leads to the surrounding pods and pools to the rear of the house. 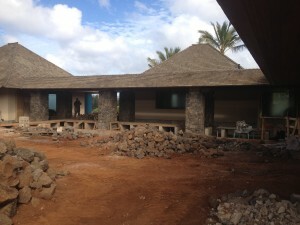 The custom rock work surrounding nearly every part of the house will be its trademark design and focal point. The flowing blend of Kauai’s natural beauty, it’s meticulous stone work, with its modern design, and exquisite finishes throughout the home, make this property truly one of Kauai’s finest homes.